Vor wenigen Tagen erst 44 geworden und schon verließ der 9 millionste Mustang das Werk und beglückt nun einen glücklichen Kunden, der ihn bei einem Händler in Iowa bestellt hatte. Der Mustang ist das Markenzeichen von Ford welches bisher am längsten überlebt hat und sich bereits 2 Jahre nach der Einführung vor 44 Jahren, über eine Millionen mal verkauft hat. Mit der Veröffentlichung des Retro Mustangs vor ein paar Jahren, wird der Mustang hoffentlich noch viele Jahre weiter leben, wir gratulieren! Ford Motor Company announced today it has built its 9 millionth Mustang. The GT Convertible Mustang is heading west to be delivered to a dealership in Iowa. 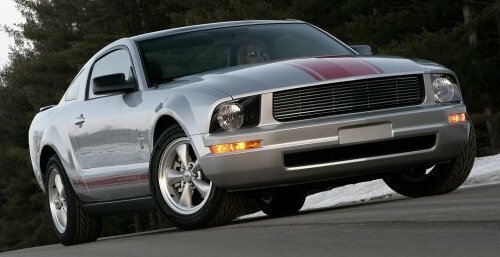 The Ford Mustang, approaching its 45th anniversary on April 17th, 2009, is one of the most widely recognized vehicles in the world. Today, one of every two sports cars sold in America is a Ford Mustang. The Mustang is also Ford Motor Company’s longest-running nameplate. Mustang was introduced on April 17, 1964, at the New York World’s Fair. Mustang sales hit an astounding 419,000 in its first 12 months on the market, and topped the 1-million mark in the first two years, shattering the sales records of any single model in the history of the automobile. Mustang leads the nearly $1-billion aftermarket parts and accessories industry as the most personalized vehicle of all time, and has been recognized by SEMA as the most accessory-friendly new vehicle. The 2009 Mustang offers a Glass Roof option and a new Warriors in Pink Package, available this summer.